We inspire our guests to adopt more sustainable lifestyles through farm stays, hands-on experiences, education programs and leading technology to preserve the planet's natural resources. The Farm offers many ways to connect with each other and with our natural environment: farm-to-table dinners, farm tours, educational programs and personal retreats. Our farm-to-table dinners feature local chefs and local produce from our farm and partner farms within Sonoma County. Farm tours and educational programs help our guests appreciate the interconnected processes involved in our natural environment. For our guests who just need some time to wind down and recharge, we offer spaces to enjoy the fruits, vegetables, meats and cheeses of the land. Lori leads all gardening activities at the farm and manages our organic certification program. Khai, Khan's younger sister, is our junior Livestock Guardian Dog (LGD) and helps Khan when she's not chasing squirrels and moles. Stella is our resident lap-goat. She is Stout's sister, so she will pair with Thunder, our 2nd SCI buck. Lily is Calla's daughter and completes the Calla-Lily goat pair. She also came to us from Foggy River Farm in Healdsburg, CA. Little Trooper, our KuneKune boar, joined us from The FarmStead near Santa Barbara, CA. He's particularly fond of Bubbles, one of our gilts. Marsellus Wallace was adopted from an office building in South San Francisco. He is being groomed to hunt rodents. Audrey, named after Chris's maternal grandmother, is our best honey producer. This colony is led by the beautiful queen bee shown above. This colony came as a nucleus hive from Bonnie Bee & Company. Bonnie Morse breeds local bees in Marin County, California. Chris leads livestock operations and is our resident beekeeper. Dharma, a McNab Collie / Australian Kelpie mix, is our herding dog in training. She will bring cosmic law and order to our tribe of goats. She came to us on April 19th 2016 from Feather (mom) and Styxx (dad) at Garcin McNab Collies. Guinness is an endangered San Clemente Island (SCI) Goat. She is our senior SCI doe and will be paired with Stout for making new SCI kids. Thunder is our 2nd San Clemente Island buck. He came to us from an accomplished breeder in Ramona, CA. He will be paired with Stella. 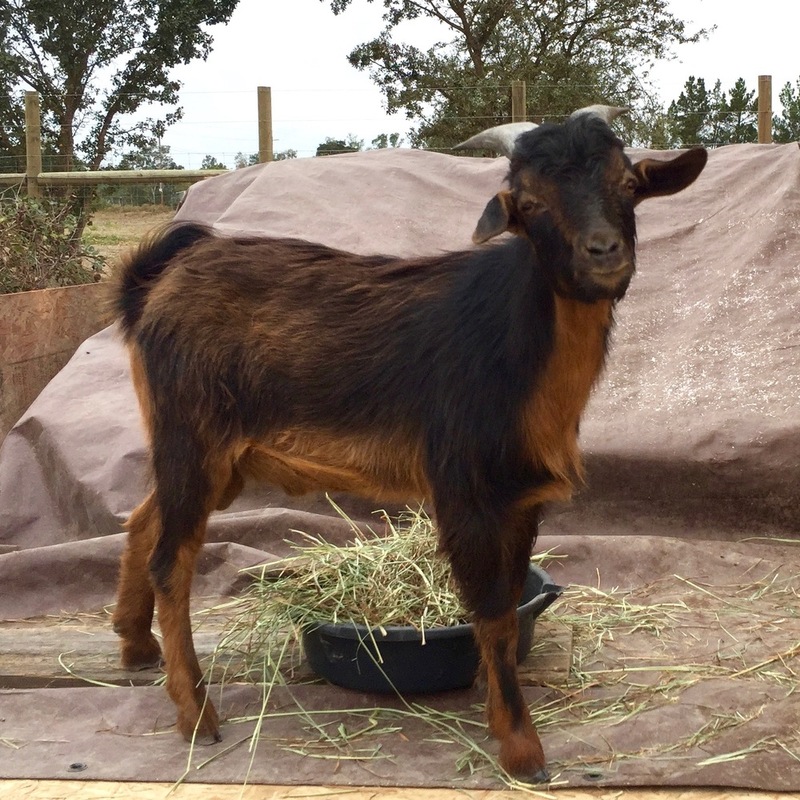 Scotch is a Nigerian Dwarf Goat wether (castrated male) from Castle Rock Farm in Vacaville, CA. He joined us to keep Stout company, but strongly prefers hanging out with the does and humans. Red is a Foggy River Farm alum and is the most relaxed goat on the farm except when Khan gets too close for comfort. Bubbles, a huge lover of belly rubs, is the daughter of the world-famous boar, Robert Bakewell from the USA Herd in Southern California. Bernice, named after Chris's paternal grandmother, also came as a nucleus hive from Bonnie Bee & Company. Khan, Great Pyrenees/Anatolian Shepherd, is our senior Livestock Guardian Dog (LGD) and ensures the safety of the Herd. Stout is an endangered San Clemente Island (SCI) Goat. He is our senior SCI buck and is extremely driven to make new kids. Calla is our senior Nigerian Dwarf doe and is the mother of Lily. She came to us from Foggy River Farm in Healdsburg, CA. Buddy is our senior Nigerian Dwarf buck and hails from Foggy River Farm. He emulates Khan in his propensity to follow your every step. Giggles also originates from the USA Herd and is super high-energy. She keeps Khai company on occasion when she's not on the move or "giggling". Loretta, named after Chris's mother, is a successful "split" colony from the Audrey colony. The queen of this colony is shown above surrounded by her attendant workers.